A former WAAF who served as a Meteorological Assistant at RAF Holmsley South in 1945 visited the FONFA Museum on Tuesday 11th April. Her visiting family group, who live locally, included two of our newest members from the March Open Day. LACW Met. Assistant Mavis J Wright, born in 1926, was welcomed by Trustee and former Chairman of FONFA Trustees, John Brooks, when she presented FONFA with a typical weather chart that was produced in 1943 and used on the station during World War II. In addition, John accepted the family’s generous donation to our charity, on behalf of FONFA. At Holmsley South, weather plots were taken on the hour, every day, over the 24 hour period. The WAAFs were billeted on the WAAF accommodation site, on the corner of Harrow Road and Lyndhurst Road, Bransgore. Mavis had the use of a bicycle to get from the airfield along the Lyndhurst Road to her Nissen hut billet, often in the dark, depending on what shift she was working. 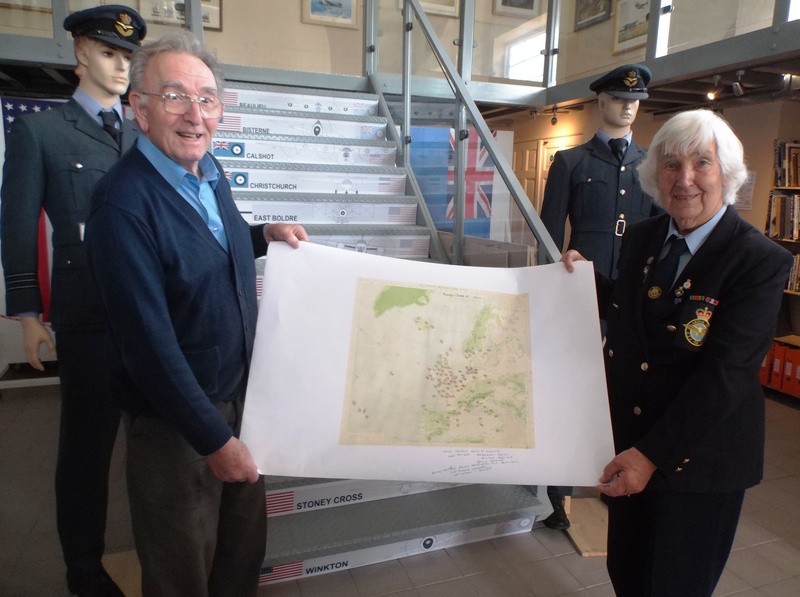 After escorting her around our Musum displays, John presented her with a print of the RAF Holmsley South Airfield Plan. On leaving, Mavis promised to send us details of all the methods of recording weather patterns, which she used.